I have so many favorite brands and products but I still haven’t found a shampoo that I absolutely LOVE! I usually just grab any one that I can when shopping but most of the time they leave my hair feeling dry and not volumized. 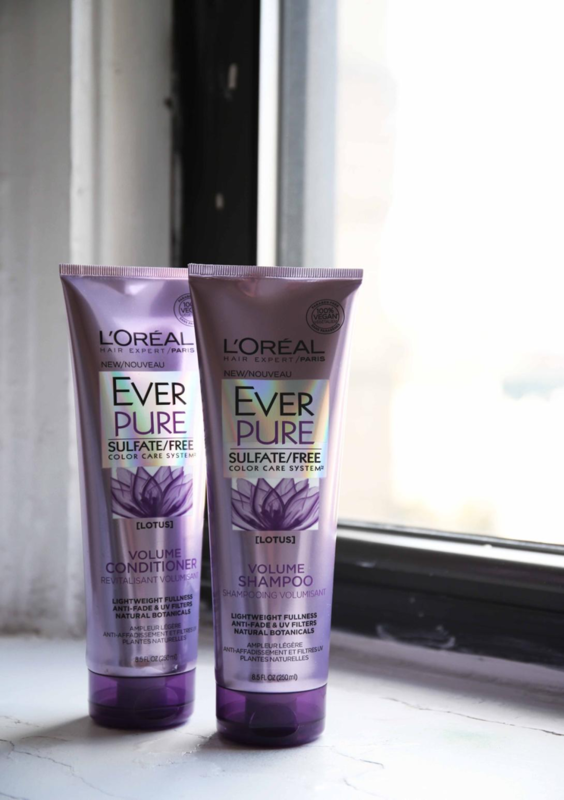 So when the opportunity came up to review L’Oréal EverPure Volume shampoo and conditioner, I was eager to try them out for myself hoping that it’s the one. I am all about caring for your hair without compromise and since L’Oréal Ever Pure Volume shampoo and conditioner has no harsh sulfates, salts, 100% Sulfate Free, 100% paraben free and 100% vegan, I decided to give a try for the full month. The first time after I washed my hair with the L’Oréal shampoo and conditioner, I let my hair air dry. This way, I could get a sense of how my hair felt after using the products, without any additional products in my hair. And I have to say, my hair did feel super soft and volumized! The product itself states that EverPure Volume system with lotus flower gently cleanses and revives fine, flat hair infusing luminous shine and boosting body without the weigh-down. My hair is fine and curly (I know, shocking) and hard to manage but after using this shampoo it felt way more smooth and easier to style. The second time I washed my hair with the L’Oréal EverPure Volume shampoo and conditioner, I blow-dried my hair as per usual — but, again, without any additional haircare products. I wanted to see how my hair held up without any additional volumizing or texturizing products. I was pleased at how fresh and clean my hair looked, and how much volume my hair still retained! My hair did still feel wonderfully soft. I’ve been using the shampoo for the last month and I am incredibly happy with the texture and shininess of my hair! Two thumbs up! Find out more here: http://bit.ly/2fEnY5G.